Owner and operator of Hilltop Auto Mart which has been under the same management for over 25 years! David has been a local resident of Columbia, Ky his whole life. He has 2 children a daughter Krissy and their youngest son Noah who both drive rebuilt vehicles. It all began over 25 years ago when the family needed to upgrade their vehicle but didn't want to pay retail from the big car lots. It just didn't make since to drive off a lot and the car instantly drop several thousands less. So David started repairing a low mileage light hit Grand Prix for the family. It turned out to be a great car for a lot less money than expected. From there the light bulb went off and the move to becoming a dealer took flight! The start of repairing low mileage, light hit, late model vehicles bought from insurance companies. 20 plus years later Hilltop has sold cars all over the US and other countries!! That have given customers safe and trouble free service for many years! Every car on the lot has had a 21 point inspection and a wheel alignment by a ASE certified mechanic. David's goal is to make sure the customer has a safe vehicle with no troubles for several years for less money than bought retail. Taking pride in being there when the customer is ready to upgrade again. Starting on the Hill as a repair shop and now a dealer has been a life changing experience for David. It has been a wonderful experience helping people get the cars they want and deserve for a lot less money and the best is yet to come! After graduating high school, Rusty worked as a mechanic on heavy equipment at the local rock quarry. After a couple years on the road working he found himself looking for a change. 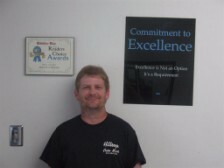 Rusty has always had a love for cars and was excited about an opportunity as a mechanic with Hilltop over 19 years ago! His role with the company is a major part of its success! He is a ASE certified mechanic. 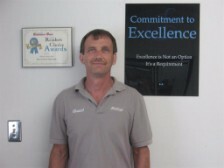 He continues to gain knowledge daily in automotive that has served this company well to say the least. In Rusty's spare time, he enjoys spending time with his family and friends riding 4 wheelers. Tina has been with Hilltop Auto Mart since March of 2014. Before joining the Hilltop team she worked sales for the local newspaper The Adair Progress and Hi-temp Graphics for a combined total of 7 years. Prior to her career in printing Tina worked for her family a locally owned and operated transmission shop her grandfather started in 1957. She has always loved cars says it's in her blood growing up in the automotive world with her family. The opportunity to work for Hilltop Auto Mart has been a great career that she truly loves! 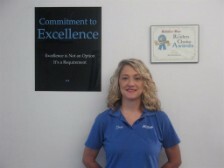 The knowledge she gained from her sales career and her childhood growing up around cars is a great asset for our team. Her number 1 goal is to treat each customer as she would want to be treated. It has served her and the company well! In her spare time she enjoys spending time with her kids Gavin and Katie. Watching her son play basketball,racing at the local dragstrip or hearing her daughter sing.